I cannot order through the website! Send an e-mail or fill out our Contactform with the style you are looking for and we will contact you within a day. I cannot find the right style! Send an e-mail or fill out our Contactform with the style you are looking for, or describe it and we will help you: we are selling Wolky's over 15 years and we do know allmost every style! What about guarantee on Wolky's purchased through the internet? On all Wolky's is the normal guarantee from Wolky, as well as our shop-service valid. If there is any problem with any Wolky (even if not purchased at our shop): just e-mail us and we will help you out. Within the US you will be given the option to either pay now (Visa, American Express and Mastercard. Alternatively, you can pay through your Paypal account), or pay after delivery. These payment options are handled by Klarna. If you have chosen to pay after delivery (14 days grace), Klarna will send you an email with further details on how to pay. Your email will contain a link to Klarna's payment site where you can settle your payment to Klarna with your card or with a bank transfer. Please note, that the option to pay with an invoice is currently only available for US customers. When you have returned your order an updated statement will be sent to you if you've made a partial return. With a full return, your statement will be closed. As soon we have registered your cancellation or your return, the repayment will be processed by Klarna within next 7 bank days. If you decide to return something after 14 days, we ask you to pay the full invoice to Klarna. After we have received your return, the repayment will be processed by Klarna within next 7 days. Or you can contact Klarna see if it is possible to postpone the due date on your payment. You can contact Klarna's Customer Service here. What are the shipping costs to the USA? The checkout with Klarna allows customers to securely save their payment information and enjoy an extremely simple and easy checkout experience. By using Klarna, you will have the option to pay up front or wait until after you receive your order, through Klarna’s pay after delivery option. What is Klarna’s pay after delivery option? If you use Klarna's pay after delivery for your order, you don't have to pay anything until 14 days after your order has shipped. Settling your payment is simple. Klarna will send you an email when your order ships, which will contain a link to the payment portal. You can pay the invoice amount using that portal within 14 days of your receipt of the payment information email from Klarna. Sometimes the option to pay after delivery does not appear as a payment option. This may depend on either Klarna not having enough information to approve the pay after delivery option, or the amount is too high. If you have any questions about your credit card payment or invoice, you can contact Klarna through www.klarna.com/us/customer-service or please call Klarna’s Customer Service. Your order will be shipped on the same or the next day, due to the time difference. They will be delivered at your door, within 10-12 days. Our standard shipments from the USA are delivered with PostNL and from the UK with PostNL and/or DPD. Please note, currently there are strict checks at U.S.A. customs. It may take longer for a package to arrive. If you are not totally satisfied with the shoes, you can return these within 28 days of receipt for a full refund/exchange. Please register your return online here before sending it back to us. US customers can return the shoes for free. Once you have notified us that you wish to return your purchase you will receive further information including our returns address. If you wish to return your order (or part of it) from outside the US then you will need to pay postage. You are free to use any shipping company for returning the shoes. The return address is; Wolkyshop, Diezerstraat 96, 8011RK Zwolle, The Netherlands. After the shoes have been returned, the full purchase amount will be booked back to your account. How can I convert my shoe size? Click here for the shoe sizes conversion table from European sizes to USA or English sizes. How are the heel height and shaft width measured? The heel height is indicated on every article card. With boots the shaft circumference and the shaft height is also indicated on the card. All ladies’ shoes have been measured with a size 38 as sample; for men’s shoes we’ve used a size 42. These measurements are merely an indicator to help you decide what shoes would fit your specific needs. These measurements might deviate depending on what size you choose. Below you can find a short overview, explaining how we can measure the width and height of our heels and shafts. Measure from the back of the shoe, from the point where your heel touches the floor to where it ‘merges’ with the back-end of the shoe. Note that with recessed heels your measurements might seem a bit off, but remember that these heels provide an optical illusion of extra height. You can view the exact measurements on the article card. The article card will also mention when your selected shoe has a recessed heel. 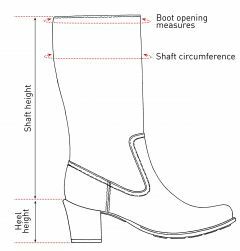 To determine exactly where the boot ends below the knee we can measure the shaft height. The shaft is the upper part of the boot, from your ankle to the top of the boot. Measure from the top of the heel to the highest point of the backside of your boot. Note: The heel doesn’t add to the total height in these measurements! 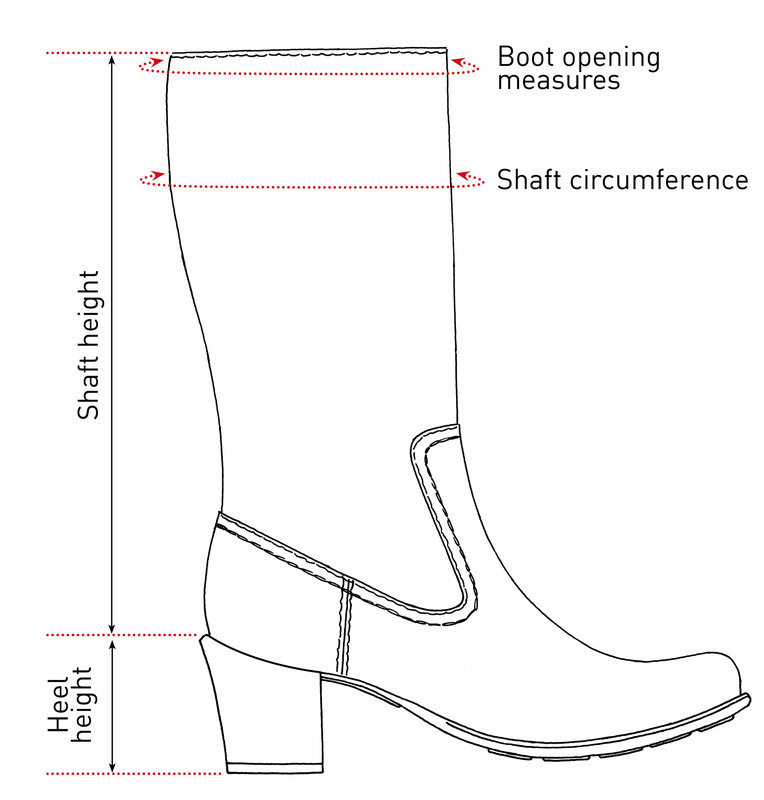 The circumference of the shaft is measured on the upper side of the boot. Remember that the material or finish of the boot is an important factor. E.g. when the boot’s upperside is lined with elastic material, even though the measurements do not account for this elasticity, the boot might still easily fit because the material can be stretched. The shaft width is measured at the greatest measurable circumference around the shaft of the boot. This applies to mid-high and high boots, and is most often measured in the calves. Please send us an e-mail or fill out our Contactform and we will answer your question as soon as possible, mostly within 24 hours.